Recording your memories is easy and economical with this kit. Learn to maximize your supplies with detailed cutting instructions while creating eight 2-page layouts. Image shows two of the eight layouts included in kit. Recording your memories is easy and economical with this kit. 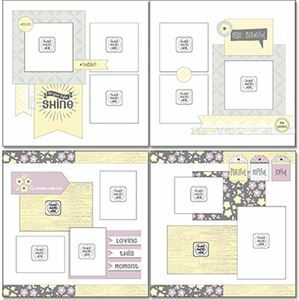 Learn to maximize your supplies with detailed cutting instructions while creating eight 2-page layouts. Use the 96 pieces as outlined in the instructions and images or add your own touch of creativity with the happy colors and designs. Get your kit today and record your memories tomorrow!